Dota-Allstars China, how do you feel? It's not the original version of dota. It is a Chinese translated version of dota but NOT the official Chinese translate version u could get at getdota.com. And this DOTA 6.56 CN has been registered copyright in China by that translate group but not for sale,it is totally free to get and play. It looks funny. We got two translate team,two DOTA in Chinese language to play.One is the official ICEFROG DOTA which could play with other translated version,one is the DOTA 6.56 CN with minor fix to fully surpport war3 1.20v and modified loading screen to show some ads. Ugh, honestly, i really appreciated IceFrog for his effort on Dota-Allstars. I even donate some money on his site to support the forums. And looking the pirated screenshot kinda make me feel sad. 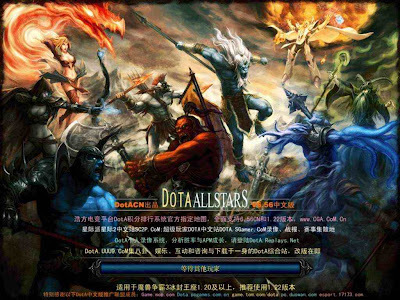 The Dota-Allstars China even not include IceFrog name in the loading screen and added advertisement. If i were Icy, i will be raged like hell. What about you? PS: You can check in here, even some chinese people also want include IceFrog name on the loadscreen. i hope there would be no race issue around here... ive seen that version b4 and it really sux.. they made profit from sumthin that came from sumone else hardwork.. damn.. y arent they releasing their own version of warcraft as it is easier for them to read tooltips as they dont use the standard international english version. This is sux..english is english! it's great to see that some groups show great interest in DotA. however, making profit from someone else's hard work is just gay. i hope the chinese players will be wise enough to pick the original & not patronize those plagarists that leech from Icy's labor. i think, it's some what a good thing, for ex; you ever play Green TD? it got many languages and many kinda version also. same idea, but, romoving the icy's name was kinda gay. if i were ice, i sued them for not putting my name. simple really , keep dota english(international). gay Chinese make profit from someone Else's work. This may be one mistake and if ice insists ,the next Chinese edtion will have his name i suppose. What's more ,the purpose of this edtion is that we haven't one Official Version of war3 1.20v which is popularly used in our Country. And I'm quite mad for what i have seen above. We made this edition because we don't have one for war3 1.20v. Icefrog can file a legal suit for copyright infringement. Just because a corporation/someone translate an article, program or media file does not give them ownership over the above mentioned material. take it easy,all the true fans know who icefrog is, we will never forget his name, he will always live in my heart :) . one more time, true Dotaers know Icefrog,donot get too upset.